Our motivation is to understand the atomistic and the electronic structure and dynamics in materials. We use theoretical tools and numerical simulation to gain insight and predict physical and chemical processes. Our studies are often stimulated by experimental observations and may involve direct collaboration with experimental groups. Although basic science is the main goal of our research, our findings and computational methodologies have technological implications and can help the design of new materials and devices with selected properties. Our methodology is rooted in theoretical physics, and particularly in quantum and statistical mechanics. Among our simulation tools ab-initio molecular dynamics plays a particularly important role. This approach captures the interplay of atomic motion and chemical bond evolution in the context of electronic density functional theory (DFT). The ab-initio molecular dynamics method, invented by Car and Parrinello in 1985, has been applied with remarkable success to a variety of problems in condensed matter and chemical physics, materials science, the geosciences, chemistry and biochemistry, and is now a standard tool for molecular simulation. While the range of problems accessible to well established computational methodologies continues to expand following the extraordinary development of computers, novel theoretical and computational tools are still needed to solve key problems in materials physics and chemistry. In this context our research focuses at extending the sampling capability of molecular dynamics methods, at overcoming current limitations of density functional theory, at including nuclear quantum effects in molecular simulations, and at modeling electronic excitations in connection with spectroscopic and transport studies. The spherically averaged momentum distribution of the protons (shown here for ice at T=296 K) is quite different from the classical Maxwell-Boltzmann distribution at the same temperature. The path integral ab-initio molecular dynamics (PICPMD) result agrees well with two experiments (Reiter and Senesi). The Maxwell-Boltzmann distribution that fits better the PICPMD data has T=859 K. An even better fit is obtained with an anisotropic (multivariate) Gaussian distribution. 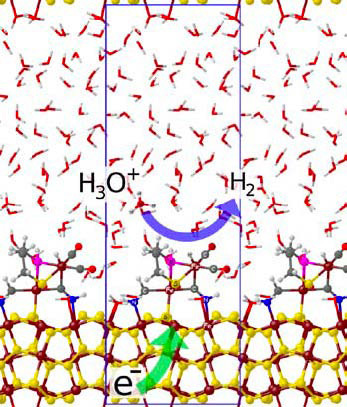 Water, the most important liquid on earth, derives its unusual properties from the network of hydrogen (H) bonds connecting adjacent molecules. Ab-initio molecular dynamics simulations overemphasize the H bond stiffness failing to describe satisfactorily a number of observations. A major limitation originates from treating the nuclei as classical particles, an approximation that is not good enough for protons at room temperature. The oxygen pair correlation function describes the equilibrium distribution of the oxygen nuclei around a tagged oxygen nucleus at the origin. 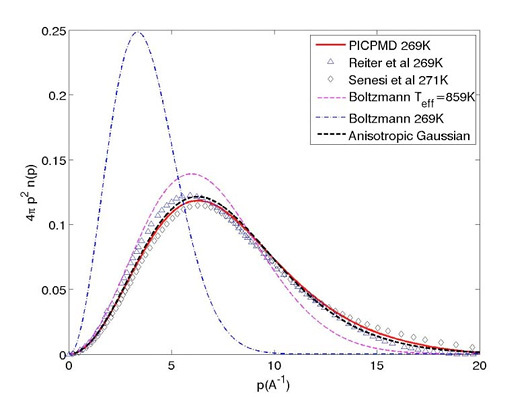 Experimental data (x-ray and neutron diffraction) at T=300 K compared to PICPMD data at the same T. The latter used the hybrid PBE0-DFT functional, which reduces the self-interaction errors of standard semi local DFT approximations. One can overcome this limitation by adopting Feynman’s path integral formulation of quantum statistical mechanics. The water structure from path integral Car-Parrinello molecular dynamics (PICPMD) agrees better with experiment than classical CPMD, but small systematic deviations remain, requiring better DFT approximations. Hybrid functionals improve the description of the electronic structure but still neglect dispersion (Van der Waals) interactions, a quantum mechanical effect originating from non-local correlations among the electrons. We are currently investigating the structural effect of dispersion interactions in H bonded systems. A better understanding of the microscopic structure of bulk water is a prerequisite to interpret spectroscopic data and should lead to improved microscopic models of interfacial water and hydration processes. Top panel: proton momentum distribution for an anisotropic harmonic model in hexagonal ice. The spherical and the directional distribution along the c axis are shown. Bottom panel: the corresponding spherical and directional mean force projected along the c axis. The curves are plotted as a function of the distance from the center of the effective potential experienced by the protons. 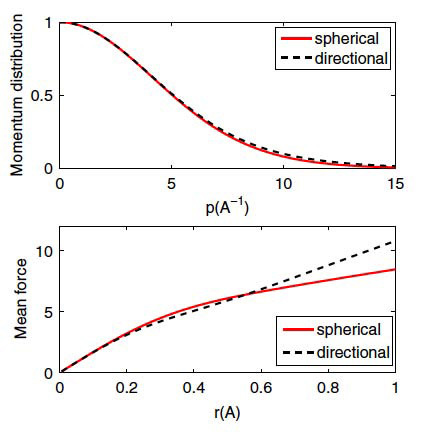 The mean force enhances the differences between spherical and directional distribution. This should make possible, in highly accurate experiments, to separate anisotropic from anharmonic effects. DINS experiments use energetic neutrons to measure the momentum distribution of the protons in a condensed environment. As a consequence of quantum mechanics this distribution is a very sensitive probe of the potential of mean force experienced by the protons. In liquid and polycrystalline materials only the spherically averaged distribution is accessible, while the directional distribution is also accessible in single crystals. However, the detailed information associated to the directional distribution is difficult to extract from experiments where incoherent contributions from all the protons contribute to the cross-section. We have formulated a theory linking directly the DINS cross-section to the mean force showing that the latter is a significantly more sensitive probe of the underlying potential than the momentum distribution. In XAS experiments core electrons are excited by absorption of x-ray photons to probe the short-range order (SRO) in crystalline and disordered media. Recently a very controversial interpretation of XAS experiments suggested almost complete collapse of the H bond network in liquid water. This interpretation was based on a description of electronic excitations based on DFT, a ground-state theory. Using a proper many-body treatment of excitations we have shown that the spectra are not only compatible with the presence of the H bond network but they also provide novel insight on its structure. 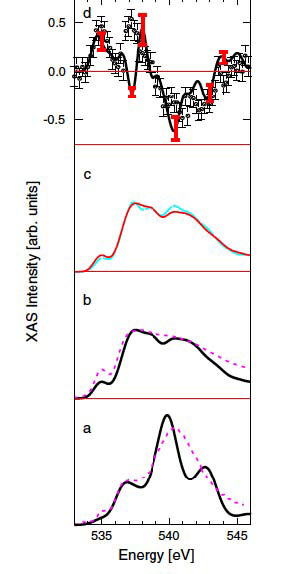 Calculated and experimental XAS spectra are shown in the left panels, from bottom to top. 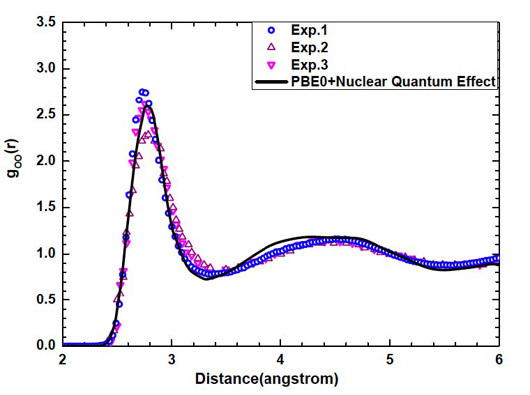 (a) Ice: Full line—theory, ice at 0 K (without nuclear quantum effects); dashed line— experiment, ice at 95 K. (b) Water: Full line—theory at 363 K; dashed line—experiment at 290 K. (c) Theoretical spectra for water at two different temperatures: blue line, at 330 K, and red line, at 363 K. (d) Difference spectra: theory and experiment (data points with error bars). In these calculations the DFT exchange-correlation potential is replaced by a self-energy operator, which is computed using an approximate perturbative expansion in the screened interaction. We are currently working to improve the self-energy approximations in XAS calculations and to extend the approach to XES cross-sections. In this context it would be extremely important to combine accurate spectral calculations to accurate atomistic models, such as those described previously in the case of water. We plan to apply this approach not only to bulk water but also to interfacial water and to glassy forms of ice. In combination with experiments these theoretical studies will shed new light on the local order of disordered and partially collapsed H bond networks. In the recent years the quest for molecular electronic devices spurred extensive studies of electric transport through organic molecules. One of the simplest devices is constituted by an alkyl chain connected via amine groups to two gold leads electrically connected to the electrodes of a battery, as in the illustration below. At low bias, transport in these insulating devices is due to quantum tunneling. Our group showed that a simple formula for the conductance G follows from linear response theory. Here N is the number of alkyls in the chain and GC and ! can be calculated with first principles electronic structure methods such as Time Dependent Density Functional Theory (TDDFT). In the case of alkyl chains simple TDDFT approximations give values of the conductance that are in almost quantitative agreement with experiment. However, the predicted conductance is an order of magnitude larger than in experiment when phenyls replace the alkyls. This error has been attributed to a misalignment of the molecular levels with respect to the Fermi level of the electrodes resulting from simple TDDFT approximations. A possible way out would be to use many-body perturbation theory methods like that adopted in the XAS calculation mentioned above. Our group is currently working to achieve this challenging goal. Ab-initio molecular dynamics simulations are used to learn how the active site of an enzyme of hydrogenproducing bacteria could be modified so that it remains stably active in an artificial production system. The coupled catalyst-electrode system consists of a modification of the active site of the di-iron hydrogenase enzyme forming a stable, tridentate link to a pyrite electrode. There is a lowactivation- energy pathway for H2 production from water, a mild bottleneck being the first protonation of the catalyst. The second protonation is much faster, and there is no further barrier for H2 desorption. This project is in collaboration with the Selloni group. The aqueous medium is a crucial ingredient here, as it enables fast proton transfers. An accurate model of these processes requires an accurate model of water and H bonds.